An Arab terrorist armed with a knife stabbed an Israeli at the Tapuach junction in Shomron (Samaria) on Tuesday morning. The terrorist stabbed the victim, identified as Evyatar.Borovsky, in the upper body, wounding him critically. The terrorist then grabbed his gun and fired at the Border Police who were stationed in the area. Border Police officers fired back, wounding the perpetrator. 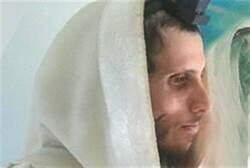 Magen David Adom teams arrived at the scene and tried to revive the 31-year-old Israeli father of five from the Yitzhar, but pronounced him dead on the spot. Evyatar was an actor who appeared in various theater productions and also worked in Yitzhar, where he lived. One of three brothers, he was raised in the village of Kfar Hassidim in the Zebulun Valley and will be buried there this evening. The Tapuach junction in Samaria has known many attacks. The last one stabbing attack occurred in mid-January, when a terrorist stabbed a 17-year-old-boy near the checkpoint. Gershon Mesika, head of Shomron Regional Authority, speaking on Radio Kol Chai reminded listeners of critically injured Adelle Biton, aged 3, who has not woken from the coma caused by a rock that hit her while she was riding in her mother's car last month. "The terrorist had no problem getting to the junction with a weapon now that the IDF dismantled so many checkposts in recent weeks... the IDF can easily bring quiet to the area if it is allowed to by political echelons...the Palestinian Authority gets tens of millions of shekels from us every month and is behind every terrorist act," he said. A Border Police force chased the attacker and managed to stop him from escaping the scene of the attack. The terrorist, a resident of a village near Tul Karem, was turned over to security forces for questioning. Click on link for videos. Terror victim participated in therapeutic psychodrama, which incorporates role-playing and improvisation to overcome traumatic experiences. Evyatar "Napo" Borovsky, who was attacked from behind and stabbed to death by an Arab terrorist, was a popular actor. He was a member of the Ar El Group, which performs in Judea, Samaria, Jerusalem and throughout Israel. Napo, as he was known by his colleagues and friends, participated in therapeutic psychodrama, which incorporates role-playing and improvisation in an effort to enable others to overcome traumatic experiences. The Ar El group also engages in playback theater and experimental improvisation. Borovsky starred in a children's production titled, "How Many Times Have I Told You That..." which espoused a humorous view of parenthood, as well as the popular Israeli Latma political satire program. His funeral tonight in Kfar Hassidim is expected to attract a large crowd of actors, musicians, friends and family. Borovsky was a father of 5 young children. The murder suspect has been apprehended and is hospitalized. He was revealed to have been released after incarceration for previous terror related activity. Ben Bresky and INN staff contributed to this report. Baruch Borovsky, father of Evyatar Borovsky, who was killed in terrorist attack this morning at the Tapuach junction, speaks about his son. Baruch Borovsky, the father of Evyatar Borovwsky, who was killed in the terrorist attack this morning at the Tapuach junction in Shomron (Samaria) said that upon originally heard news of the attack, he was unable to come to grips with the reality of the situation. "I saw the attack on television and knew it was not good, but I ignored it, hoping for the best, and moved on… until I received the message that the victim was Evyatar," he said. "I did not tell my wife anything," he told Galei Tzahal Radio. "He was a tzaddik, a righteous man," Baruch said of his son, Evyatar, who was in the middle of a medical clowning course. That was "his life's mission", he said. "He was not afraid to live in this area despite my efforts to dissuade him from living there." Evyatar was murdered at the age of 31 on Tuesday morning by an Arab from the nearby Arab town of Tul Karem. He was the father of five children, the oldest of which is seven years old. The terrorist stabbed Evyatar in the upper body. Magen David Adom teams arrived at the scene and pronounced him dead on the spot. He will be laid to rest in Kfar Hassidim in the Zebulun Valley at the foot of the Galilee, where he grew up. Evyatar Borovsky, 31, was laid to rest Tuesday evening. He was murdered by a Palestinian Authority resident terrorist, who stabbed him to death while he waited for a ride at the Tapuach Junction. Several hundred people attended the funeral. His widow, Tzofia, was at the funeral with the couple's five children. She called to the media, "Look, five orphans." Evyatar's father Baruch eulogized him. "I can't believe that I'm here," he said. "Surely tonight you'll get up, you'll laugh and say, ‘I fooled you.'" "That's what you always did, made everyone happy," he said. He added, "Go before G-d and say, ‘I am the last sacrifice.'" Samaria Regional Council head Gershon Mesika spoke as well. He called on the government to reestablish checkpoints in Judea and Samaria (Shomron). Former Prime Minister Ehud Olmert took down dozens of checkpoints in the region as a "good-will gesture" to the Palestinian Authority. Mesika also said, "Those who downplay rock throwing, and a judge in the state of Israel who called rock throwing ‘an act of mischief' – they share responsibility for this murder."